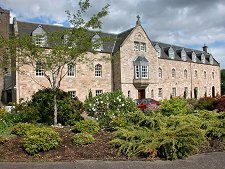 Pluscarden Abbey lies in the tranquil, sheltered valley of the Black Burn some six miles south west of Elgin. Pluscarden's story in one of abandonment after the Reformation in 1560, followed by restoration in the 20th Century. Visitors to Pluscarden Abbey are, unless disabled, asked to leave their cars in the designated area and walk the last couple of hundred yards to the abbey itself. As you approach the abbey from the east you can feel the centuries fall away and you move back in time to a quieter, simpler, more devout world. And when you leave you feel you are taking with you some of the tranquility that pervades this beautiful place. Pluscarden Priory was founded by King Alexander II in 1230, who asked the Valliscaulians, a Benedictine Order, to found a community here: part of Alexander's agenda was to demonstrate his authority over what had until recently been a disputed part of his kingdom. 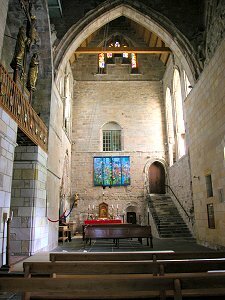 A sister house was founded at Beauly Priory, and another at Ardchattan in Argyll. The Priory was probably finished or nearing completion when the Edward I's English army stormed through Moray in 1303. It isn't know if Pluscarden Priory suffered damage at their hands, but it seems likely. 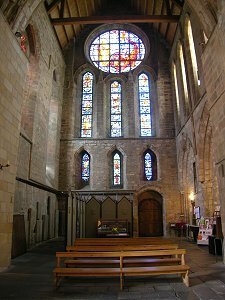 If so, repairs would have followed fairly quickly, and from 1345, Pluscarden came under the control of the Bishop of Moray from his seat in Elgin Cathedral. 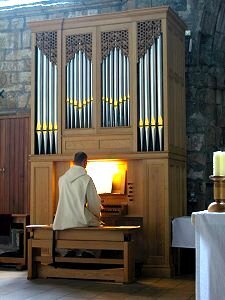 The link with the Bishop of Moray did not work in the Priory's favour. Some badly judged local politics in 1390 led to Bishop Alexander Bur falling out with Alexander Stewart, the younger son of Robert II. The Bishop caused Alexander Stewart to to be excommunicated for marital infidelity. 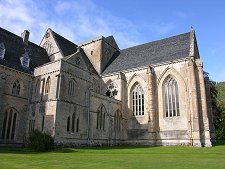 Alexander Stewart, better known as the Wolf of Badenoch responded by descending on Moray with an armed band of Highlanders and burning down Elgin Cathedral, much of the towns of Elgin and Forres, and Pluscarden Priory (see our Historical Timeline). 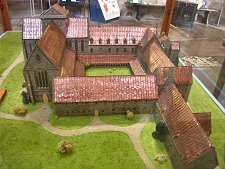 Repairs followed, but by 1454 Pluscarden Priory was again in a state of disrepair and the number of monks had shrunk to around half a dozen. 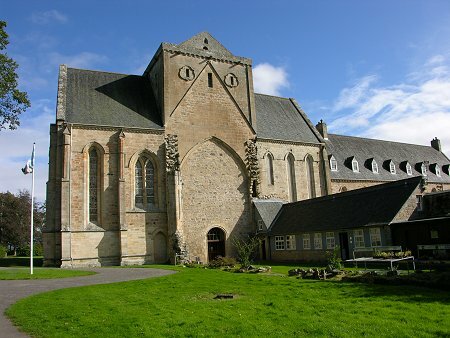 The Pope agreed an amalgamation with Urquhart Priory, a Benedictine Priory five miles east of Elgin. A major programme of rebuilding followed at Pluscarden, now a Benedictine community, which continued well into the 1500s. On Prior Alexander's death in 1560, Mary Queen of Scots granted Pluscarden Priory and its remaining lands to the Setons. In 1587 this religious appointment was translated into a temporal Lordship, although significantly the head of the Seton family retained the legal title of Prior, ensuring that the continuity of the title was recognised in Scots law. Fast forward to 1897, and Pluscarden was purchased by the convert to Catholicism, John Crichton-Stuart, 3rd Marquess of Bute. By 1897 the nave of the priory church had been removed and the transepts and choir were roofless. Parts of the prior's house has been converted for use as a Free Church, and the previous owner had partly restored the east range for use as a ballroom by his estate tenants and as a lodge for shooting parties. The Marquess of Bute carried on the work of restoration at Pluscarden, and built a Presbyterian Church in the valley to which the congregation then using the Prior's House could move. 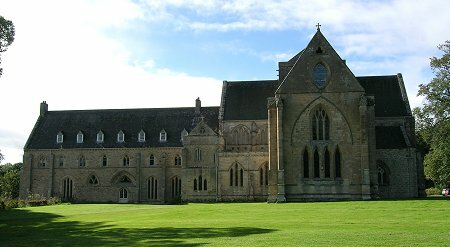 In 1945, Crichton-Stuart's younger son handed Pluscarden over to the Benedictine community at Prinknash Abbey in Gloucestershire, for use as a daughter house. The first mass was held in the roofless church of the reborn Pluscarden Priory on 8 September 1948. The tower was reroofed in 1954 and Pluscarden became independent of Prinknash in 1966. In 1975, after 750 years as a Priory, Pluscarden was granted the status of an Abbey. Since then restoration of Pluscarden Abbey has continued. Visitors today can view the splendid transepts and crossing, and chapels in part of the choir. 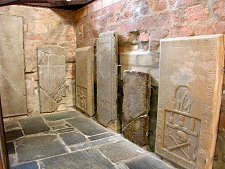 There is also a range of visitor facilities in the low range on part of the site of the nave. Much of the rest of the abbey is naturally reserved for the use of the monks and guests on retreat, including the beautifully restored east range and the newly constructed west range, opened in 1993. Work and fund raising continues, with the eventual aim of restoring the whole of Pluscarden Abbey to its former glory.